Millennials, the population born between 1980 and 2000, is the most important demography for eCommerce. The retail industry is experiencing the influence of this generation like never before. As per a research by Goldman Sachs, Millennials are the major driving force who have redefined the purchase habit and revolutionized the shopping experience. Retailers need to reevaluate their business strategies to communicate with this generation of customers, better. Now, why the Millennials pose to be the most important segment, in terms of eCommerce! A glimpse of research conducted by the leading firms will say all. As per data of U.S. Census Bureau, there are almost 80 million millennials in the country, which makes the segment largest in the population. Their annual buying power is almost $600 billion annually and by the end of this decade, it is expected that they will be almost half the workforce in the USA alone, leave the rest of the world. This generation prefers digital media than the traditional shopping channel. Reports prove that millennials spend more than any other age groups in eCommerce, they contribute to almost 35 percent of retail spending. To reach the highest echelon in Digital Commerce, now it is important for retailers to attract this generation. For a loyal customer base, retailers have to address the need of Millennials and improve the shopping experience. Technology is an intrinsic part of the lives of millennials, it helps them to communicate with brands, both online and offline. And, if the trend is to be believed, to thrive in the competitive landscape, eCommerce merchants need to integrate online and offline stores. Millennials use different devices, like smartphone and tablets for shopping, but this does not mean that they are restricted only to online stores. There is also an influx of millennial shoppers in the brick-and-mortar stores. Multichannel strategy– Online and offline, both are important media of shopping for the millennials. They prefer visiting the stores to touch and feel the products, but check the review and ratings on the Internet. This generation can live in both the worlds comfortably and the brands need to focus on both the sales channel. A personalized experience of shopping is an important determinant for them. They demand a seamless, integrated experience of shopping, irrespective of the sales channel. High-quality products and superior customer service are a must for these shoppers. By implementing a smart strategy retailers can ensure that products are visible across diverse buying channels. Optimize customer experience– A participative strategy that engages customers, lies to the core of a good customer experience. Be it logging in, browsing the products or paying for goods, all should be mobile-friendly to attract the shoppers. Research highlights that millennials are more selective about their purchase in comparison to other age groups. They need to feel that they are part of something trendy and fashionable, so optimizing the shopping experience is a must. Trend shows that consumers of this age group share their experience in the form of review with friends. Retailers, to expand the base of loyal customers and increase market share, should implement a well-crafted strategy that aims at an easy and convenient shopping. So, e-tailers can provide an unbiased review of the products and let customers make an informed purchase decision. 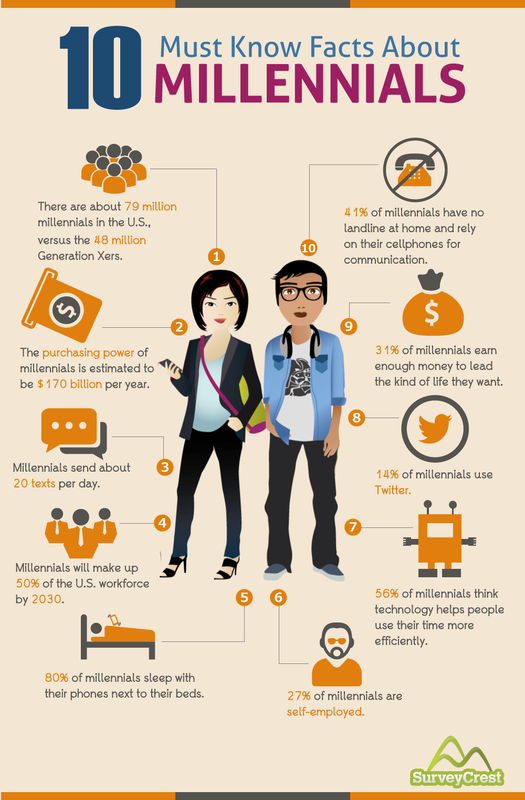 Brand loyalty is another important characteristic of the millennials. Unlike other consumers, millennials are highly connected with the brands. They are well-informed about the brand. Smart technology and social media have bridged the gap between customers and brands. If customers relate to brands better, there is a greater chance of customers returning back. Brands need to emphasize on deeper engagement to attract customers. They need to focus on specific areas to improve the brand loyalty. Online Reputation Matters– Product research and reviews are a major driving force for the millennial customers. Millennials are tech savvy and they have the information about products that they intend to buy at the fingertips. The majority of them use the social media to share a negative and positive experience with a brand. Research reveals that almost 66 percent of millenniums ask advice of friends to make the purchase decision, and almost 89 percent of them, rely on recommendations than what the brands claim about products. Any negative feedback on the online media can lower the performance metrics of the product and hampers the brand image. So, it is needless to explain the importance of maintaining a positive reputation on the social media. Loyalty Programs– A report suggests that approximately 78 percent millennial choose brands that provide rewards and loyalty programs. Discount coupons and reward points make customers happy and shopping exciting. These may be in the form of free shipping or discount on the selling price and urge customers to patronize a brand. Statistics say that a discount of 20 percent is enough for the customers to visit any retail location. Again, 75 percent consumers are ready to switch brands if there is a provision of real-time promotional offers and discounts. Retailers can seize this opportunity and offer reward points or coupons to attract the millennial customers. Shopping campaigns– Image-based ads, product listings ads reach out to the targeted customer. Retailers need to structure the campaign based on the brand name or keyword. Millennials are driven by visuals and when they see the ad in the result page of a search engine, it proves the reliability. Customer Service– Millennial customers expect eCommerce companies to provide superior customer service. A click-and-chat option helps the customers to connect with the brands or sellers to answer their query. Be it redeeming points or returning the products, immediate response can do wonders for the retailers. This generation appreciates the brands that listen to them- be it through the social media, community pages or forums. It shows that the brands care about them. For a two-way communication, retailers can start a dialogue with the customers by asking them questions and answer the comments on your blog or social media posts. If they have provided you a feedback, then take it seriously and improve the service of your business. Retailers must listen to the needs of the Millennial and adapt to the changing shopping trends. Millennial customers expect high shopping experience, regardless of what they buy or the sales channel through which they shop. Retailers need to update their strategies to accommodate the changing trends and rising expectation of the customers. It is important to be on the same page as that of the Millennials and pave the way for an eCommerce retail business to expand the reach.